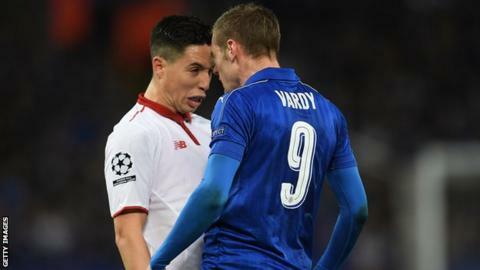 Sevilla midfielder Samir Nasri has accused Jamie Vardy of cheating following his red card in Leicester's Champions League victory on Tuesday. Nasri, 29, was dismissed for a second yellow card in Sevilla's 2-0 last-16 second-leg defeat, as the Foxes reached the quarter-finals 3-2 on aggregate. Nasri and Vardy clashed in the second half and were booked for butting heads. But the on-loan Manchester City star believes Vardy's response convinced referee Daniele Orsato to take action. "For me he's a cheat because if he was a foreign player you, the English press, would be saying he's a cheat," he said. "They were winning 2-0, play the game like a man. You are not better than us but you are winning 2-0 and will qualify, just play the game." But England striker Vardy refuted Nasri's allegation, saying: "I'm not a cheat and I never have been. That's all I've got to say on the matter." A Leicester spokesman added: "The club refutes entirely any allegation that questions the professional integrity of Jamie or any of its players." Sevilla were already 2-0 down on the night after goals from Wes Morgan and Marc Albrighton. And they were forced to play the final 20 minutes with 10 men as they chased a crucial goal. France international Nasri needed to be escorted off the pitch by his team-mates, which took over three minutes. "For an international player you don't need to do that. Look at the image. Yes he did it, but he did it well," he said. "He played it well. I thought the English players were tougher than that. He is the one who came to my face. "It was a foul or something and then he pushed me and I said 'what are you doing?' and then he came to my face. That's what happened. "If I tell the truth I don't think you will be able to write it. I would love to speak to him - there are too many cameras and security and I have to think about next year and not getting a big suspension." Could Leicester defy logic once again?